Doshab is a digested, concentrated fruit juice. It is made of mulberry juice with no added sugar. It has the consistency of thick gravy. Mulberry doshab is made solely from mulberries. 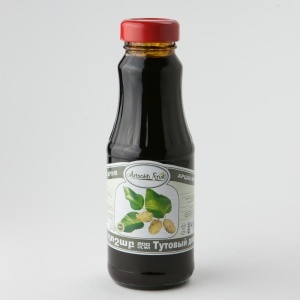 Mulberry doshab plays the role of excellent seasoning for meat dishes and salads, and can also be used as a concentrate in the preparation of desserts. Mulberry doshab is an effective natural drug, it helps with a strong cough and bronchial asthma. Store the opened bottle in the fridge. 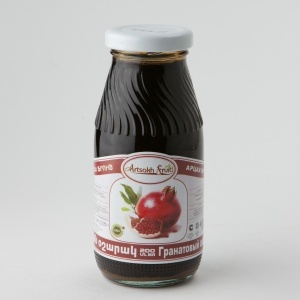 100% natural pomegranate osharak sauce is a viscous maroon liquid which is obtained from pomegranate juice by evaporation for a long time. It has a pleasant sweet-sour, slightly tart taste of ripe pomegranate. Ideal for meat dishes, fish and chicken. Garnet osharak has a positive effect on the cardiovascular system in general, and has the ability to increase hemoglobin levels. Ingredients: Pomegranate, sugar, antioxidant: citric acid E330.